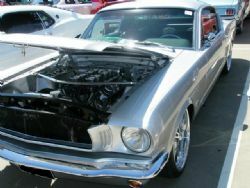 The 28th Annual All American Day was held on the roof of the Castle Towers Shopping Centre at Castle Hill and was hosted by the Mustang Owners Club of Australia NSW Inc. 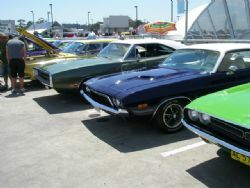 The event is exclusively for American built vehicles and the Children's Hospital at Westmead benefits from proceeds raised on the day. I’ve been to this event a number of times and it has the usual complement of trade stands spread amongst four hundred plus American classics. An added bonus are the cinemas, department stores, specialty shops, food outlets and coffee shops in the shopping centre that allows the other half to get in some solid retail therapy while the fellas check out the cars. It also offers a respite from the heat and although this year wasn’t as hot as some in the past the combination of concrete, blue skies and thirty degree temperatures saw brisk business being done by hat sellers and all shady spots well patronised. Up for grabs this year was twenty nine trophies and the calibre of cars was impressive. 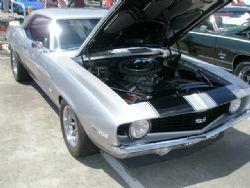 Mustangs from 1964 through to current models made up the largest marque represented and there were plenty of other Ford, GM and Chrysler classics on display. 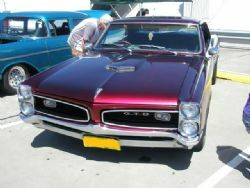 Some outstanding hot rods, lowriders and customs could be viewed and the majority of cars were pretty original albeit to a high restoration standard. In between shade stops the good sized crowd of spectators were spoilt for choice on what to ogle on next. This is a show that allows you to get up close and personal to the cars and a lot of the owners will gladly have a chat about what they have done to their rides. With numerous bonnets up enthusiasts had the chance to get ideas for their projects and I saw more than one guy lying under a classic checking out what someone had done to their drive train. Held every January on the roof of Castle Towers this event is definitely worth a look if you are into American classics. It is a good venue to take photos and park with the downside being the aforementioned heat on a good day. Getting out of the place can be challenging and I wonder if it was held a month or two later how many more enthusiasts they would get that are currently holidaying outside of Sydney. If you’re interested in viewing top quality classics at a well run event put this in your diary for next year.